By way of CWILA self-monitoring update: 38% female, 45% male and 17% multiple or non-binary. I think it’s important to notice because blithering along, defaults run disproportional to who is around. Not that one needs parity and equilibrium with the world, or else I’d be watching misogynist Hollywood not reading, let alone reading poetry. Here, have you read this discussion with Elisa Gabbert? That said, back to stats, at the time of writing, 40% of the books I’ve read this year were published this year or last. 19% were written at or before the 1850s. Not quite as much older stuff as I planned. As much as I searched, only 10% are by people of colour. Makes visible how much easier access to white people is. Books by queer writers (GLBTQQ) is a worse ratio. Its 12% over the last few months fell to 5%. But there are probably 2 dozen books in progress around the place that may re-skew those proportions. Surprisingly to me, only a quarter of titles are Canadian. I had intended to read more international but tipped further than I expected. 39. Emily Dickinson: Poems (Vol. 1). If I knew Dickinson did so much religious verse, I’d forgotten. Perhaps when I read her last it had been water to a fish. She spoke “the calvary of woe”. Likewise I guess, the sadness was such my usual state it made no impression. Such an ache of waiting when time was even slower than now. Although, absorbed in paying attention, time goes more quickly anywhere. She has a way with metaphor and I can see the case that hers is a more modern verse than her era often was. The poems varied a lot naturally, considering its an anthology across countries. One Wife for One Man by Frank Aig-Imoukhuede dialogues the culture-front where preacher says one man and woman and locals say grandfather’s models worked. Women kept other wives in check. No one had to be excellent at all things. A striking poem by Peter Abrahams was called “Me, Coloured” was a about a boy trying to work out what he is, since a boy he met at the river has a tribe and claimed his Zulu people used to have a king. With the simplicity of childhood he asks his mom plain questions and continues to play. This is a trippy kind of book. Each page may leap anywhere, from surreal poem to drawing to anecdote to crossword. Any may be fictional or somewhere else on the fiction spectrum. Having seen Kevin reading from it three times, or rather, not perform it but outsource it somehow, it is all part of the schema of the book. In the Toronto launch he asked a woman to write his obituary and read that which she did, the death of each minute of who he used to be. In another case he had audience members read a piece. All the pieces were written by others. But what is Authorship? What is owned? What is ownership. What is known? What is verified? What is sense? What is self? Community? The pieces are eclectic, electric, strange. I kick myself for having seen the call and never jumped in the ring too. Fun thing it is. I said more here in BookThug recommended summer reads. Over at another stage of poetry of the page, and performance, A Pretty Sight was launched with finger puppets of Sid Vicious and Socrates. And a band doing mood musical accompaniment. These poems are all by O’Meara. They vary in tone but have his cadence. You can listen to him read one and talk about them in the May Literary Landscape show. These poems are more slow contemplative in this book, tighter, more detailed and concrete and grittier than his 1999’s Storm Still and with more exploration of extended thought than he did in 2003’s The Vicinity. It’s funny how it seems more conversational and yet there is more density. I’m not sure I can back that up and agree with my impression without sidelining myself into re-reading Storm Still. A favourite is A Pretty Sight the time travelling through Circa Now, letting the cascade of history fall thru time and space, rise to space pov. “80,0000 inches of continental drift” to a Kerala market to Star Wars to Virgil and once bustling spa town of Heirapolis to tai chi grannies conjuring longevity. One gaze to take in the whole mandala of the universe from the grateful present to the known but unseen to the read of, to the feet. It’s not hard to believe these are her ultimate work. The book was her legacy as she raced time against cancer again. Rough playmate, cancer. 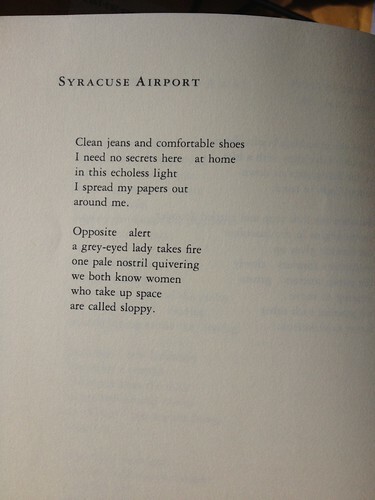 Her rage of earlier poem was more solid defiance, rule-setting, and solidarity such as in this poem. She had a sort of eye for details such as in the poem “Production” which is about a bee farm of 100,000 bees sorted by Sadiq and Curtis. At the end of the day, what can you say but, “Tomorrow we will make a living/two dollars at a time”. This was a riveting sort of read. He has taken the A More Perfect Union speech delivered by President Barack Obama on March 18, 2008 (which itself uses a phrase from the 1787 preamble to the constitution) to disassemble intent. What is the structural intent of each phrase? What if we take out the specifics of which country and which demographic? What is we point out that this is to tie that. It is hard to explain why this works so well. Watch a video of the reading. This book was not at all like the derivative caricatures of it of mad scientist, leaving out entirely the dignified gentleman. It was much more complex. It was rich in sensory details to transport. It is not about the chemistry so much as social norms, sense of identity. He was in existential crisis and found his imperfections intolerable so tried to cleave himself into unrepressed and fully suppressed so he could behave perfectly and be perfectly free.